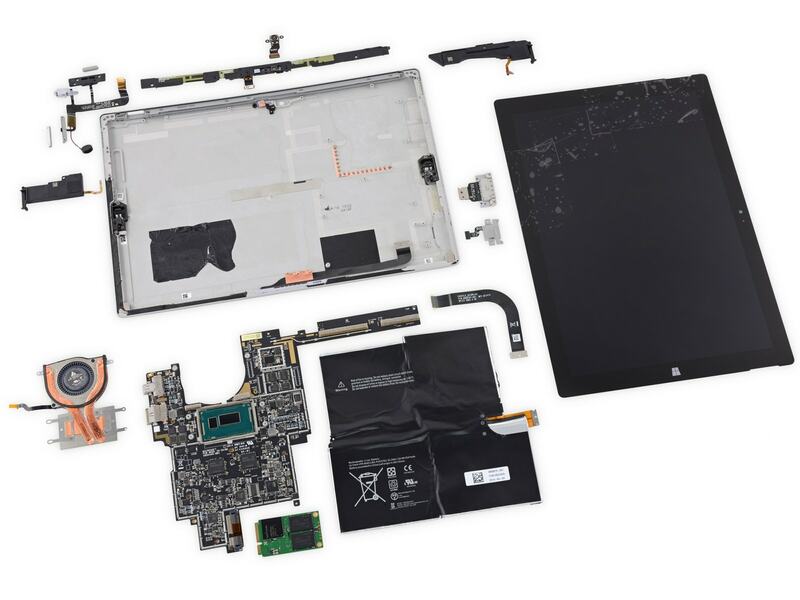 Microsoft's third tablet qua laptop made a pit stop at the repair specialists at iFixit over the weekend. The Surface Pro 3 packs more computing power into a smaller space than I would have thought practical, and that comes at a price. iFixit has revealed that this tablet is not repairable by anyone other than an official tech with official tools (and maybe not even then). While iFixit did mange to tease apart the components, they also shattered the screen (twice). Once inside, they found that many of the components are either glued in place of attached with T3 Torx screws, making it very difficult for even the most ambitious and foolhardy DIYers to add after market modifications. They did note, though, that once the battery was unglued it could simply be unplugged. And the SSD was oddly easy to swap out, assuming you don't mind destroying the screen while opening the case. The Surface Pro 3 is both larger and thinner than the earlier models, which could explain why it is rated as being less repairable. It sports a 12" screen with a screen resolution of 2160 x 1440, and it runs Windows 8.1. Weighing in at 800 grams and measuring a mere 9.1mm thin, this tablet is thinner and lighter than its predecessor (it's also lighter than the 13" Macbook Air). Microsoft launched a trio of Surface Pro 3 models last month, including models with a Core-i3 chip ($799) and s Core-i7 chip ($1,549). All run Windows 8.1. In Niven and Pournelle’s MOTE IN GOD’S EYE they had ubiquitous pocket computers that were essentially a giant integrated circuit and totally unrepairable. Dirt cheap, too. We’re not there but the trends point that way. We’re already at the point where it’s not worth repairing cheap Android tablets. I wonder if they expected their prediction to come true after only 40 years? Tablets volume just quit, can’t seem to get the volume back , bar says all volume but no sound comes out!! !